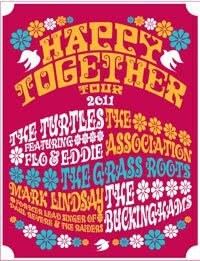 Review of Happy Together (with The Buckinghams, The Grass Roots, The Association, Mark Lindsay from Paul Revere & the Raiders, and The Turtles) concert at the Chumash Casino, 8/11/11. Mark Volman and long-time collaborator Howard Kaylan were founding members of The Turtles, whose 1960’s hits include “Happy Together” and a cover of Bob Dylan’s “It Ain’t Me Babe”. When The Turtles disbanded, Volman and Kaylan joined Frank Zappa’s Mothers of Invention, and due to contractual reasons adopted the names Flo & Eddie. Flo & Eddie performed on the Zappa albums Chunga’s Revenge, Fillmore East June 1971, and Just Another Band from L.A., and in the movie 200 Motels. Flo & Eddie also sang background vocals for T. Rex, including on the worldwide hit “Get It On (Bang A Gong)” and the albums Electric Warrior and The Slider. And that’s just scratching the surface. They also sang on records by notable artists including Bruce Springsteen (“Hungry Heart”), The Psychedelic Furs (“Love My Way”), Stephen Stills, Alice Cooper, Ray Manzarek, Keith Moon, The Ramones, and Blondie. Volman is also the Chair of the Entertainment Industry Studies program at Belmont University in Nashville. This is from a phone interview with Volman on July 29, 2011.